The paintings in No Boundaries were made by nine elderly men from the Western Australian desert. These men were revered as leaders in their communities, their worldview defined by an ancient cosmology in which ancestral spirits exerted a continuing presence in everyday life. But Paddy Bedford, Janangoo Butcher Cherel, Tommy Mitchell, Ngarra, Boxer Milner Tjampitjin, Warlimpirrnga Tjapaltjarri, Tjumpo Tjapanangvka, Billy Joongoorra Thomas, and Prince of Wales (Midpul) transformed the visual traditions of their people into contemporary artworks. Despite coming to art late in life, and being mostly unknown to one another, they were innovators of the highest order. 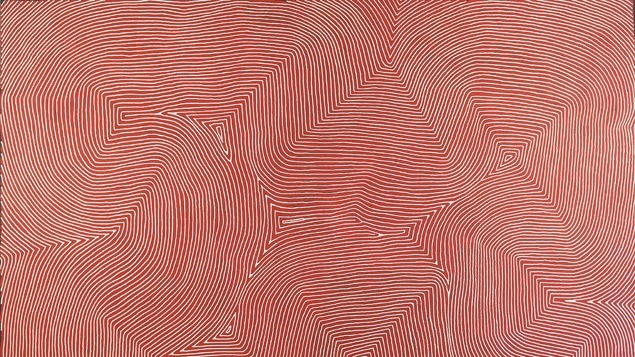 Where their predecessors in the early 1970s had drawn on cartographic and figurative imagery, these men forged a new path in abstract images that broadened the possibilities of Aboriginal art. During the last three years the Nevada Museum of Art has been working with Aboriginal artists who live in the remote Paruku region of Western Australia on a unique art & science project led by Australian painters Mandy Martin and Kim Mahood, and conservationist-rancher Guy Fitzhardinge. The paintings and materials generated by both the Aboriginal and kartiya (non-indigenous) artists were donated to the Center for Art + Environments Archive Collections in 2013 and exhibited here in the summer and fall of 2014. There is a close connection between the Paruku paintings and the artworks in No Boundaries, which also hail from the northern part of Western Australia. Hanson Pye, the Aboriginal elder who painted two of the most important works in the Paruku project, learned how to paint from his grandfather, Boxer Milner Tjampitjin, whose works figure prominently in the Scholl collection. Within the collections of the Nevada Museum of Art there are manifold connections among disparate artists forged through a commonality of mark-making, the preservation of stories and cultural heritage, and the conservation of the natural world. The work of Australian Aboriginal artists is of special import in this context as the roots of their work reach back more than 50,000 years, and represent the oldest continuous cultural production in the world. All the paintings in No Boundaries are drawn from the collection of Debra and Dennis Scholl, Miami-based collectors and philanthropists.